Did Turkish Intelligence Green-Light the Ankara Bombing? Originally published under the title "Why We Should Assume Erdogan Played a Role in the Ankara Bombing." 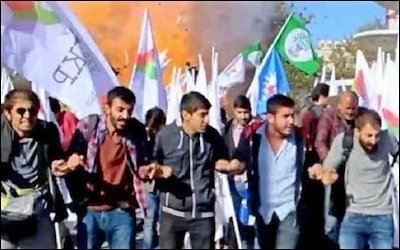 The bomb went off as marchers for Turkish-Kurdish peace danced arm in arm. It's an especially delicate time in Turkish politics, between a first round of voting in June that resulted in a hung parliament and a second round scheduled for November 1. The frenzied run-up to the latter election has witnessed growing violence against the country's Kurdish minority, starting with an attack in July on peace marchers, leaving 33 dead; a spate of Kurdish revenge attacks on policemen and soldiers; an entire Kurdish town, Cizre, placed under siege; and Kurds responding by declaring autonomous zones. Then, on October 10, came the worst act of violence in modern Turkish history, a double bombing outside Ankara's central railroad station that killed at least 105 marchers for Turkish-Kurdish peace and injured over 400. No one claimed responsibility for the assault, prompting politicians and analysts – myself included – to engage in intense speculation about the perpetrators' identity and purpose. It would make no sense for ISIS to independently undertake this operation against Kurds. The first hunch, that the Islamic State (or ISIS, ISIL, or Daesh) independently undertook this operation against Kurds makes no sense, for although Kurds are ISIS' most effective enemy in neighboring Syria, to target them in the capital of Turkey against the wishes of the Turkish state would be an act of folly, as ISIS depends heavily on Turkish aid and does not want to provoke Turkish air strikes. ISIS involvement must have taken place with the connivance of Turkish intelligence. The government has a motive: Eager to win a majority of seats in the next election both to avoid corruption probes and legitimately increase his power, President Recep Tayyip Erdoğan has initiated a quasi-war against the Kurds of Turkey hoping thereby to rouse Turkish nationalist feelings. The Ankara bombing fits exactly into this pattern. Further, it conforms to Turkish intelligence's history of dirty tricks, including some against Kurds, as well as a pattern of fabricating evidence against domestic rivals (such as the military or the Fethullah Gülen movement). ISIS involvement must have taken place with the connivance of Turkish intelligence. No less important, eyewitnesses recounted how the police used tear gas "as soon as the bomb went off" and "would not let ambulances through," leading angry victims to attack police cars. Selahattin Demirtaş, the head of Turkey's pro-Kurdish party, put the same thought more poetically: "The state which has information about the bird that flies and every flap of its wings was not able to prevent a massacre in the heart of Ankara?" Until further information becomes available, we should assume that the Turkish president's hands are implicated in this horrid incident.